The miniature is unfinished and is best described as a sketch. On comparison with other examples in Cooper's output, including some in the Royal Collection, it is apparent that it is one of several sketches retained by the artist as the basis for making fully finished portraits on demand, possibly in considerable numbers. However, no finished miniature of Catherine of Braganza by Cooper following this pattern, or indeed any other, survives. It seems that the sketches were originally made on rectangular pieces of vellum and that they were later shaped as ovals, probably while they remained in the possession of the artist's widow. In the 1670s there was considerable interest in obtaining examples of Cooper's work. Cosimo III, Grand Duke of Tuscany, who had been painted by Cooper in 1669, opened negotiations for the purchase of the sketches belonging to Mrs Cooper in 1674 but declined to buy, because of the price. In 1673 Charles II had agreed to pay the artist's widow an annuity of £200 for life in return for some examples. The fact that he defaulted on his payment may have caused her to withhold items, including some of the unfinished sketches; these are not recorded in the Royal Collection until the reign of James II. Catherine of Braganza (1638-1705), the daughter of John IV of Portugal, married Charles II in 1662. 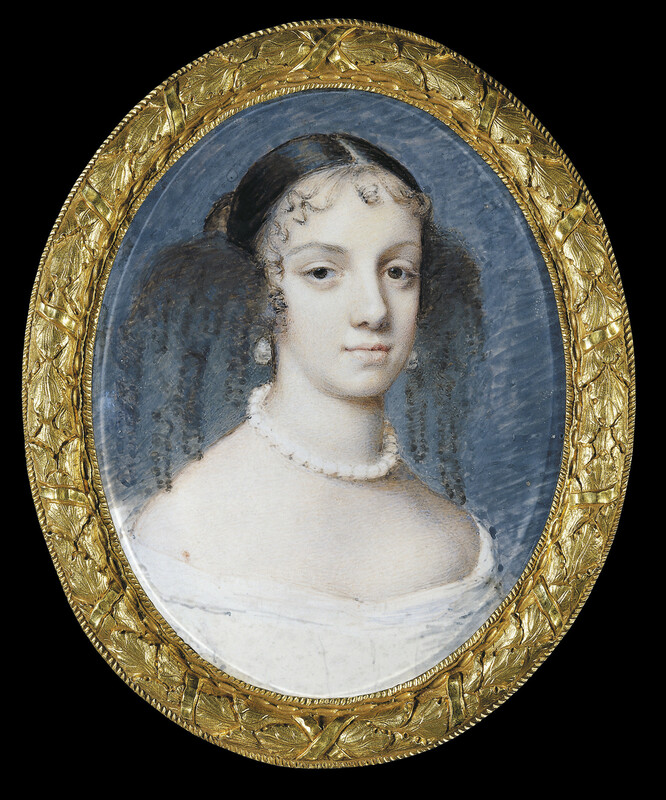 This miniature probably dates from shortly after her arrival in London. Her appearance gave rise to some comment since she was small and sallow, and she dressed in an old-fashioned manner. John Evelyn remarked that her teeth jutted out too far, but that her eyes were 'languishing and excellent'. The King referred to her at one moment as resembling a bat, but later described her 'as good a woman as ever was born'. The Queen's dowry was good and included the cities of Tangiers and Bombay. There were no children of the marriage and the Queen retained her Catholic affiliations which made her unpopular. She lived at Somerset House and after Charles II's death remained in England until the reign of William III and Mary II, when she returned to Portugal.